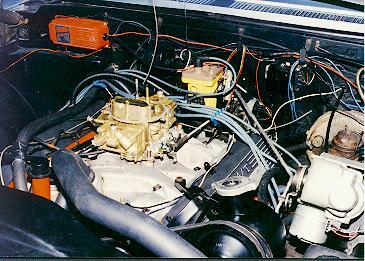 This is how the engine looked after the second rebuild was installed in the Starfire. Some of the interesting items in this picture include: Holley 750 double pumper, Edelbrock 04B aluminum intake manifold, Accel Super Coil, MSD 6-A ignition module, and an original Olds cruise control (lower right corner). This cruise control uses an electric servo motor instead of the vacuum motors used on later cars.